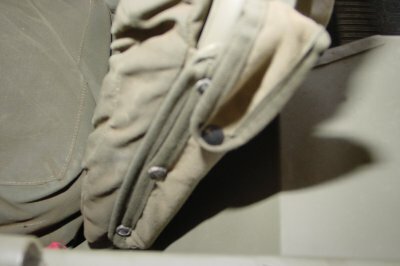 Above are two pictures of the air gage scabbard designed by Lt. Craft during WW2. The scabbard was made by Dave Pizzoferrato of WeeBee Webbing, www.odcloth.com. He used the drawing with CADD equipment and a tiny bit of help from me and was able to quickly knock one off. Look for these at any MV show he attends. Dear Ed, Here’s a couple of ideas that keep our tire gages and spare keys anchored and in plain sight too. T/4 Benny Pilara, our shop foreman, is the pappy of the following: knock out the second rivet in each of the data plates on the glove-box door of the l/4-ton, make a spring clip for each and of the tire gage from the metal bands taken from any packing case and rivet them on the inside of the door. Paint the outline of the gage on the door, slip the gage into the clips and there is no excuse for the cry. “I’ve lost mytire gage.” And the spare key? 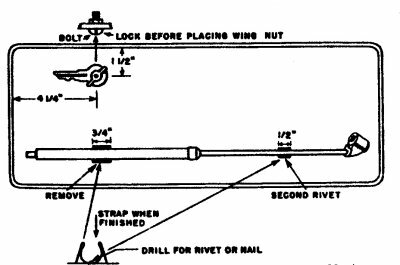 Just drill a 3/16 bole in the glove-box door, insert a 3/16 x 3/4 stove bolt, tighten the nut, put the key on the belt and fasten it in place with a wing nut taken from an ammunition box. 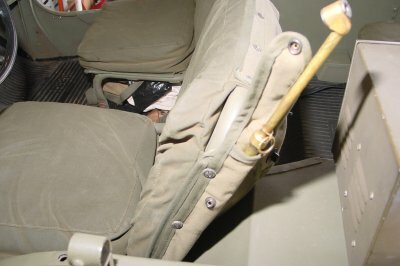 The same idea may be used en any vehicle except the amphibian which has no glove compartment. S. J. Freeman M/Sgt. 307th Inf.